Distribution and habitat: Nephrolepis exaltata Bostoniensis is an evergreen fern, native to tropical regions throughout the world. It is common in humid forests and swamps, especially in northern South America, Mexico, Central America, Florida, the West Indies, Polynesia and Africa. The fronds are 50–250 cm (20-98 inch) long and 6–15 cm (2-6 inch) broad, with alternate pinnae (the small “leaflets” on either side of the midrib), each pinna being 2–8 cm (1-3 inch) long. The pinnae are generally deltoid, cut into a number of segments, so that the plants have an exceptionally feathery appearance. The pinnate vein pattern is also visible on these highly compound leaves. The edges appear slightly serrate. Nephrolepis exaltata cv. Bostoniensis has gracefully arching fronds. 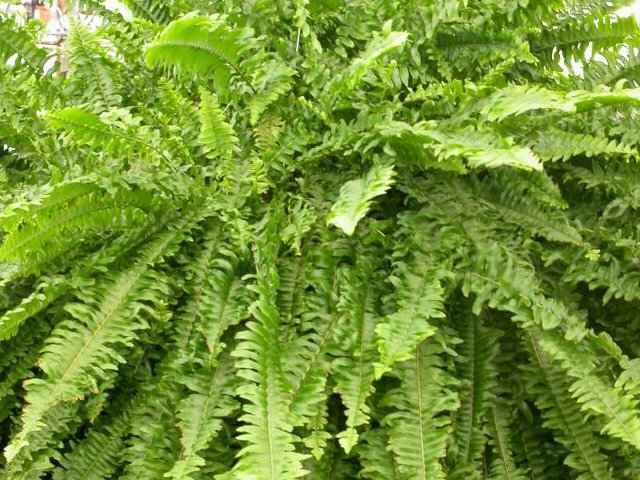 Houseplant care: Nephrolepis exaltata Bostoniensis is one of the easiest of the ferns to grow indoors. In some of the extremely feathery forms of Nephrolepis exaltata Bostoniensis one of the fronds of the plant occasionally revers to the original species. Cut out any long, insufficiently segmented fronds as soon as they appear. If permitted to survive, they will take over the plant. Light: Provide to Nephrolepis exaltata Bostoniensis bright light without direct sunlight. If necessary these ferns can tolerate medium light for periods up to four or five weeks. Temperature: Normal room temperatures are suitable throughout the year. Minimum tolerable temperature is 10°C (50°F). For Nephrolepis exaltata Bostoniensis grown at temperatures above 21°C (70°F) increase humidity by standing the pot on a tray of damp pebbles and mist-spraying the foliage daily. Nephrolepis exaltata Bostoniensis may appear totally dead due to frost, it will re-emerge in the spring. Watering: Never allow Nephrolepis exaltata Bostoniensis to become dry at the roots. As long as room temperatures remains above 13°C (55°F), water the plant plentifully as often as necessary to keep the potting mixture thoroughly moist. If the temperature drops below 13°C (55°F) for more than a day or two, allow the top third of the potting mixture to dry out completely between waterings. Fertilising: Apply standard liquid fertiliser every two weeks to Nephrolepis exaltata Bostoniensis actively growing in peat-based potting mixture. Feed actively growing plants that are in soil based mixture about once every four weeks. Potting and repotting: Use either a standard peat-based potting mixture or a combination of half soil based mixture and half leaf mould. When the roots of the Nephrolepis exaltata Bostoniensis have filled its current pot, repot in the spring, moving the plant into a pot only one size larger. After maximum convenient pot size has been reached, remove the plant from its pot every spring, carefully trim away some of the outer roots and replace the plant in the same pot, which has been thoroughly cleaned. Add fresh mixture as required. Propagation: This plant is usually propagated by division of the rooted runners, as named cultivars will not produce true spores. Propagate whanever desirable by potting up a new plantlet taken from any point where the tip of a runner has rooted down. Use a sharp knife to cut through the runner about 5cm (2 inch) from the tip, thus releasing the rooted plantlet. Plant it in a 8cm (3 inch) pot of the preferred potting mixture for adult plants and treat it in the same way as a mature specimen. Problems: Nephrolepis exaltata Bostoniensis will shed fronds if potting mixture dry out, at which point all fronds may be cut back to about 5cm (2 inch) to regenerate. Treatment: Apply fungicides: be certain the Nephrolepis spp. to be treated is listed on the fungicide label. Insects: The most common are caterpillars, fungus gnats, mealybugs, mites, scale, and thrips. Treatment: spay plants with appropriate pesticide. Repeat the treatment after 3 days and again 10 days later. If the insect attack persist, try a different pesticide. Uses: Nephrolepis exaltata Bostoniensis is a very popular house plant, often grown in hanging baskets or pedestals. It is a perennial hardy plant in warm climate zones as erosion control, ground cover, massing or woodland garden. Outdoors Nephrolepis exaltata Bostoniensis prefers partial shade or full shade, inside it grows best in bright filtered light. Nephrolepis exaltata cv. Bostoniensis is said to act as a natural air humidifier, removes formaldahyde and is a general air purifier. Said to be among the best in air purifying houseplants. Also, Nephrolepis exaltata Bostoniensis is known to be non-toxic, so it is safe to be grown around pets (cats). Note: Nephrolepis exaltata Bostoniensis is classified as an invasive alien plant in South Africa. In some provinces it must, by law, be eradicated. In others, a permit is required to import, possess, grow, breed, move, sell, buy or accept one as a gift.